Higher temperatures, drier conditions, increased fuel availability, and growing warm seasons—all linked to climate change—are increasing wildfire risk in California. In 2017, the combination of a wet winter followed by extreme heat and dry conditions has fueled record wildfires in many Western states. In early December, a series of fires extended this trend when they erupted in the mountains north of Ventura and Los Angeles, California. The Thomas Fire, which began on the evening of December 4, is the largest blaze and grew quickly to nearly 31,000 acres (50 square miles) in less than 12 hours. As of January 1, 2018, the Thomas Fire was 92 percent contained and had burned 281,893 acres establishing it as largest fire in California recorded history. A mixture of dry foliage, low humidity and high sustained winds of more than 30 miles per hour led to its explosive growth, according to Fire Sgt. Eric Buschow. Other major fires included the Creek and Rye events. Research indicates a direct causal link between human-induced climate change and increased wildfire risk in California. Climate change has contributed to California's longer fire seasons, the growing number and destructiveness of fires and the increasing area of land consumed. What's Making California’s Wildfires So Dangerous? Did Climate Change Worsen the Southern California Fires? The fingerprint of global warming has been been found in California wildfires. Extreme wildfires in California are consistent with long-term trends that show increasing wildfire activity observed in the western U.S. Since 1970, temperatures in the American West have increased by about twice the global average, and the western wildfire season has grown from five to seven months on average. Climate change has contributed to California's longer fire seasons, the growing number and destructiveness of fires and the increasing area of land consumed. The Thomas Fire is California's largest wildfires on record. 14 of California's 20 largest wildfires on record have all burned since 2000. The Thomas wildfire ignited on the evening of December 4 about 50 miles west-northwest of downtown Los Angeles in Ventura County amid ideal fire conditions. Surface fuels, composed of thick grass and shrub-land after a heavy rainy season, were extremely dry due to ongoing drought and record high summer and fall temperatures. Sustained winds of at least 30 miles per hour and gusts up to 50 mph helped to spread the flames. By the morning of December 5, the fire was spreading at a rate equal to one football field each second, according to analysis provided by meteorologist Jim Cantore. California has already had several major wildfire events in 2017 where extreme heat and dry conditions combined to dangerous effect. 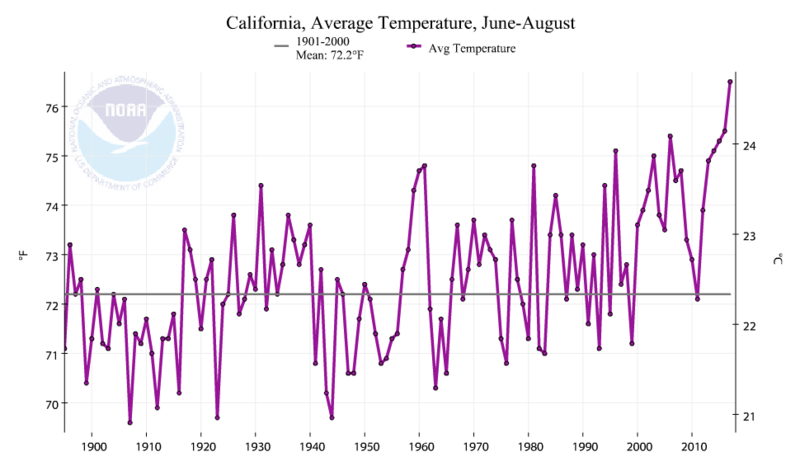 After a record-warm June through August (see image to the right), California experienced the greatest statewide heat wave ever recorded from late August through early September. Many locations broke daily, monthly, and all-time temperature records. Record heat continue through late November. On September 1, the La Tuna Fire erupted north of downtown Los Angeles and is the largest to burn within Los Angeles' city limits. The next month, California experienced its most deadly and destructive wildfires on record. The southwestern United States has already begun a long-predicted shift into a decidedly drier climate. Extreme heat and years of ongoing drought, both linked to climate change, are increasing wildfire risk in California by contributing to the frequency and severity of wildfires in recent decades. From 1979 to 2015, human-caused climate change was responsible for more than half of the dryness of Western forests and the increased length of the fire season. Since 1984, those factors have enlarged the cumulative forest fire area by 16,000 square miles, about the size of Massachusetts and Connecticut combined. Observed changes in California's climate towards drier conditions and warmer temperatures help to explain why 14 of the states's 20 largest wildfires on record have all burned since 2000.